As a podcast listener of ever-increasing severity, when I moved to France in 2012, I thought: what a great way to practice my French! But then after looking and asking and listening around, it seemed French podcasts were nowhere to be found. Sure, there were radio shows available as a podcast download, but as these shows were born for broadcast, they couldn’t hold my attention as a non-linear listener. There were too many panelists talking over each other. No, these shows were produced for mass audiences listening live. Then, in a couple years time, there were some rumblings, Slate France launched two pods in 2016: Transfert and Sales Gosses. Around the same time, Nouvelles Écoutes was founded with their flagship pod La Poudre, an interview series on feminism. More production studios were popping up, founded by ex-legacy radio folks: notably Binge Audio and BoxSons, the latter which operates uniquely through paid subscriptions. Not ones to be left behind by the new studios, legacy players such as Arte and France Culture have begun investing in original podcast content. #mood: “And what are you listening to?” & “The ear is erogenous zone”. Indeed. 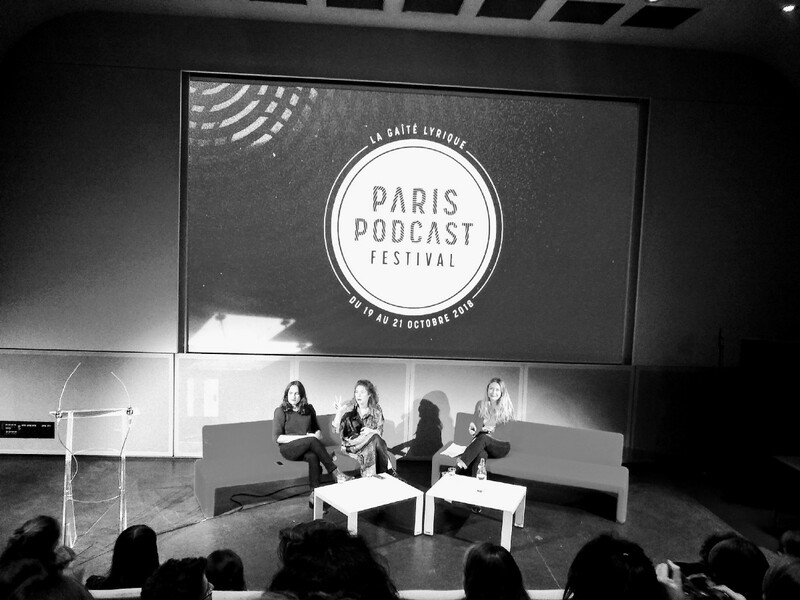 The festival kicked off on Friday 19 October with a keynote dialogue with Jenna Weiss-Berman, co-founder of Pineapple Street Media — the only international podcaster at the festival — moderated by Louie Media co-founder Charlotte Pudlowski. Charmingly, the two seemed equally excited to speak to each other about their respective companies and projects. You can see the the French studios (Binge, Nouvelles Ecoutes, Louie) with similar editorial goals of representing voices often left out of mainstream media. Jenna addressed the recent industry shake-ups of BuzzFeed and Panoply making big cuts to their podcasting departments (Jenna is the former director of audio at BuzzFeed): “Not every media company is going to have their own podcasts. If they do, they need to give them the resources they need to thrive.” She cited The New York Times’ heavy investment in audio staff and projects as a good example of this. NYT is a client of Pineapple Street, which produces the culture show Still Processing. Regarding relationships between new audio studios and legacy broadcasters producing podcasts, Jenna explained how radio producers are attracted to come work for Pineapple (or Gimlet, etc.) for the higher paychecks. To retain talent, radio directors have come to consult with her at Pineapple on how to offer competitive salaries, and the talent returns. She said that studios like hers create a positive feedback loop within the whole audio ecosystem. These insights are good food for thought in the burgeoning French scene. The rest of the festival had a densely-packed programme of live recordings, on-stage interviews and group listening experiences. The listening sessions took place in a theatre and gave the bizarre experience of turning a behaviour that for me, and many, is deeply personal into something collective. It was strange and delightful to consume a podcast as if I was at the cinema. The room was packed for the Transfert listening session and the audience was reacting together, gasping and groaning at each plot twist. Louie Media co-founders Melissa Bounoua & Charlotte Pudlowski discuss their podcast Transfert. I arrived a bit late to the collective listening of Calls, a series in the experimental format of an “imageless TV show” produced by Canal+. I found a seat in the dark theatre and subtitles jumped across the screen as we listened in on emergency responders trying to help a woman that had been kidnapped. It was a very tense listening experience and, having missed the introduction, I was quite relieved when I realised that this was audio fiction. One of the creators, Norman Cooper, said that his team dreamed up Calls because they wanted to shoot a film, but they didn’t have the budget. It’s the audio equivalent of The Bay, or other “found footage” films. An apocalyptic plot line is strung together via audio “retrieved” from voicemails, an airplane black box or audio technicians on a film shoot. Another highlight was Ça s’est passé ici (It happened here), a binaural audio documentary, conceived to be consumed in the Parisian locations where they were recorded. Ça s’est passé ici offers multiple listening experiences. It reminded me of the film Derek Jarman’s 1993 film Blue, a 79-minute feature length film whose visuals consist of only a blue screen. The story is told through audio, but the visual is important, trapping the viewer in a cinematic experience. Despite the comparatively nascent stage of the French podcasting industry, consumption is similar to the US, at least in one regard. 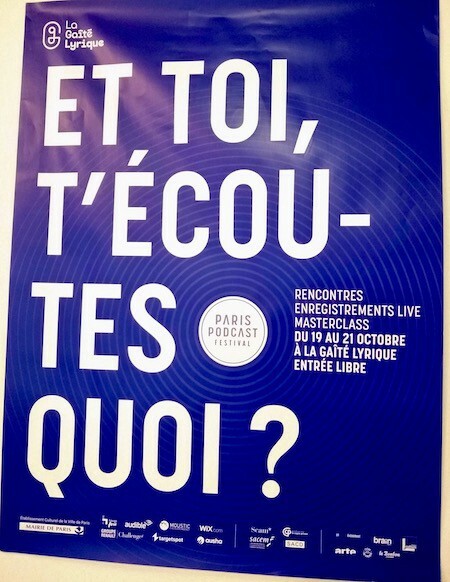 Thirty-nine percent of French people have never listened to a podcast, according to an OpinionWay and Audible study conducted last year (versus 40% of Americans, according The Infinite Dial report). 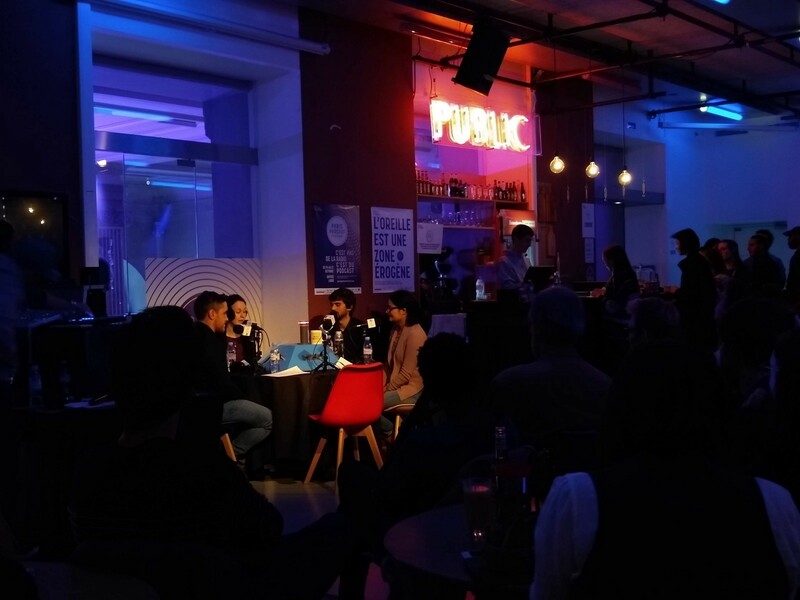 Often, at the mention of podcasts in French media, you’ll see the distinction “podcast natif”, to indicate this is not a downloadable version of a linear radio show. I suspect the OpinionWay and Audible study did not distinguish between replay versus native podcasts. The Paris Podcast Festival site includes a handy definition of native podcasts, underlining that this is content meant to be consumed non-linearly. Yet, it would be wrong to only look to the American podcasting model to divine the future of the French market. With paid subscriptions, studios like BoxSons and the recently-announced Majelan could create business models that are not only sustainable, but highly profitable. Look at the almost entirely subscription-based $7.3 billion Chinese podcasting market. (US podcasting is also trying to hop on the paid subscription train.) 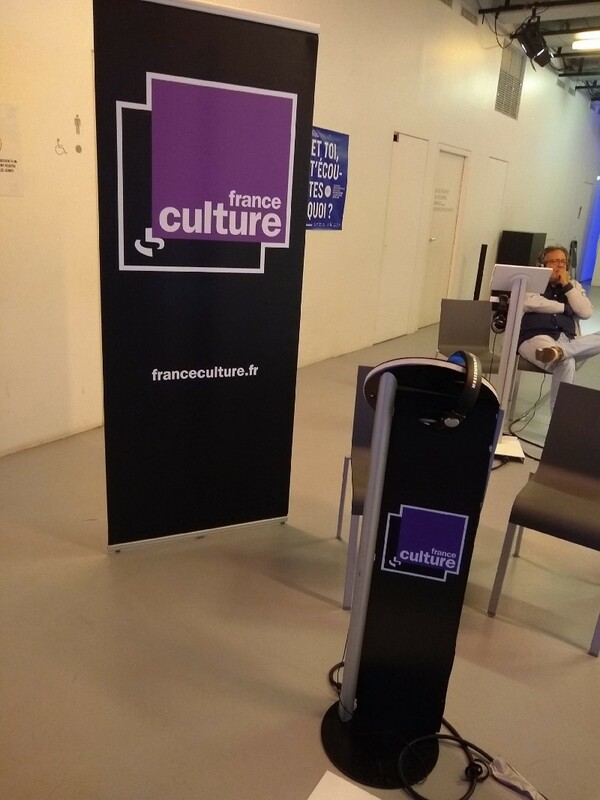 Thanks to public culture subsidies and other funding models in France, the country is fertile territory for new and experimental formats that result in works such as Calls or Ça s’est passé ici. French podcasting, much like French culture at large, will be famously and stalwartly, French. Vive la France ! Vive les podcasts !